“One of the most extraordinary books ever issued by an American commercial publisher,” Blueprint for Counter Education was designed as a portable, interdisciplinary learning environment for a new, politically-charged, process-based model of education. 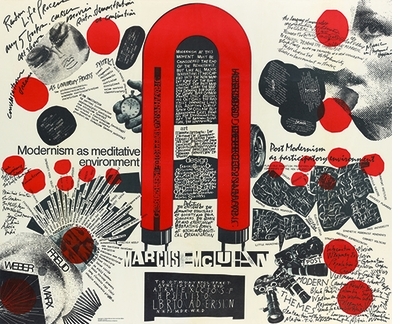 Originally issued by Doubleday in 1970, the publication consisted of three large posters and a “Shooting Script” and offered a fluid cosmology of radical thought and syncretic bibliography conceived in the classrooms of the sociologists Maurice Stein and Larry Miller and given form by the gifted designer Marshall Henrichs. In 2016 Blueprint was reissued in facsimile with an added booklet of reflections and interviews by Harvard’s Jeffrey T. Schnapp (VC’75) and the designer Adam Michaels, founder of the graphic design studio Project Projects, published by Michaels’ Inventory Press. The Art Library editions of both the original issue of the publication and the reprint will be on view in the Frances Lehman Loeb Art Center Focus Gallery, through October 2, 2017, courtesy of the Center, the Library, and the Creative Arts Across the Disciplines Initiative. In addition there will be an Agnes Rindge Claflin Lecture by Jeffrey Schnapp and Adam Michaels about the publication and its contemporary relevance on Thursday September 28 at 5:30 in Taylor 203, followed by a reception and viewing of the exhibit in the Frances Lehman Loeb Art Center. On the morning following the Lecture, Talking About Teaching will host a teach-in workshop for the Vassar community led by Jeffrey Schnapp and Adam Michaels beginning at 9:00 a.m. in Taylor 203 entitled: “BLUEPRINTING: PROJECTS FOR THE AFFIRMATION Of NEW EDUCATION,” supported by The Program for Teaching Development at Vassar College, the Tatlock Chair of Multidisciplinary Studies, and the Art and Media Studies Departments. Breakfast and Lunch will be included. A related exhibit of Adam Michaels’ work is on view in the Art Library main reading room entitled: “Inventory Press LLD and the Design of Contemporary Arts Publishing” September 27 through October 15.